This article originally appeared in The Hill and has been republished with permission. Today, Senator Bob Dole joins other American leaders like Thomas Edison, Rosa Parks, and poet Robert Frost as a recipient of the Congressional Gold Medal—the highest award bestowed by the U.S. Congress. First awarded to George Washington in 1776, the Congressional Gold Medal honors individuals whose achievements have had a lasting impact on the nation. As a decorated World War II veteran and the longest-serving Republican leader in Congress, Dole has dedicated his life to public service. Among his achievements, his lifelong work as an advocate for the world’s hungry remains one of his most enduring legacies. Having first witnessed hunger and poverty as a child during the Great Depression and, later, while serving in war-ravaged Europe during World War II, Dole played a lead role in shaping America’s efforts to alleviate hunger, both at home and abroad. Nearly every U.S. government program designed to prevent and address hunger bears his imprint. From the national school lunch program to WIC and SNAP, Dole’s deep commitment and tireless efforts to end hunger have become central pillars of our country’s safety net system and a profound statement about our values as Americans. His leadership also provides a model of bipartisan collaboration. Together with fellow anti-hunger champion Senator George McGovern, Dole transformed how the U.S. feeds the most vulnerable among us. Though their views on a range of policies may have differed, they were united in the belief that no child—anywhere in the world—should suffer from hunger. Both worked within their respective parties to build a lasting, bipartisan commitment to end the scourge of hunger. Even after both Senators retired from Congress, their shared passion for ending hunger did not waver. Dole and McGovern had an idea about how to apply lessons from the national school lunch program to help ensure that hungry children in the world’s poorest classrooms have access to a nourishing meal. Thanks to their efforts, the aptly named McGovern-Dole International Food for Education and Child Nutrition Program was established in 2002. What began as a powerful idea has since grown into a global school meals program that has fed more than 22 million children in 41 countries. This important work has helped ensure that children throughout the world receive a meal in school—often the only meal they get that day—not only providing the necessary nutrition, but drawing children to school, helping transform their hunger into hope and opportunity. Bob Dole’s efforts to fight hunger exemplify how the power of an idea—and a commitment to seeing it realized—can truly change the world. 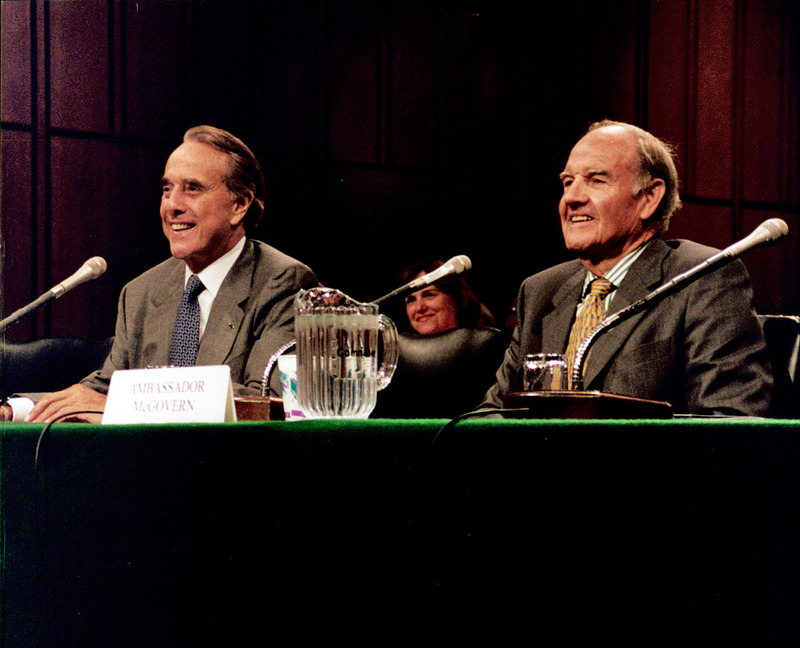 For the past two decades, Senator Dole has served on the Board of World Food Program USA, an organization built to continue America’s legacy of leadership in fighting global hunger. His active leadership and support for these efforts continue to this day. Bob Dole embodies the best of America. He personifies the values and principles upon which our nation was founded. Thanks to his dedication and statesmanship, he has shaped the lives of millions of families in need—not just across America, but across the globe. Senator Dole, we are honored and humbled by your service to this country, to the world and to our collective future. Your inspiration has motivated your colleagues, supporters, and people across the country. Congratulations on this well-deserved honor. Rick Leach is the president and CEO of World Food Program USA, a non-profit organization that proudly supports the mission of the U.N. World Food Programme, the planet’s leading hunger relief agency.